Thanks to my Curlkit subscription I have been very lucky to try some REALLY good products since my version of the “big chop” (see: How I removed my dreadlocks) and this of course kicked my product junkie habit into high gear. So. Many. Good. Products. I. Can not. Contain. Myself. If you don’t know about SheaMoisture, their all-natural products were already pretty established (since 1912 as boasted on the label) but have garnered quite a bit of popularity amongst the natural hair community over the last few years – thanks to exposure on YouTube and blogs. I myself learned all about them from YT reviews; the more I watched videos and read blogs the more I wanted to try them but they weren’t easy to come by in Canada. The neighbourhood hair store (Kaks Hair Emporium) has served me well for all my hair needs at really affordable prices, and I have been longing for the day that they would start carrying the popular SheaMoisture line. So when I started noticing they were slowly becoming more available north of the border, I wished and wished and wished upon a star that they would arrive in my neck of the woods. I almost collapsed and needed to be resuscitated as a result of the excitement. There were the products that through my extensive SheaMoisture stalking… errrr…research… that I knew I’d want to try, namely the “green” label items for fine and thin hair, because my hairline has thinned over the last couple years and is thankfully slowly recovering. So why is it that I almost grabbed every possible product and had to calm myself down? Why was I standing in the store giving myself a pep talk that went something like: “Chris, the store is across the street. Put. Some. 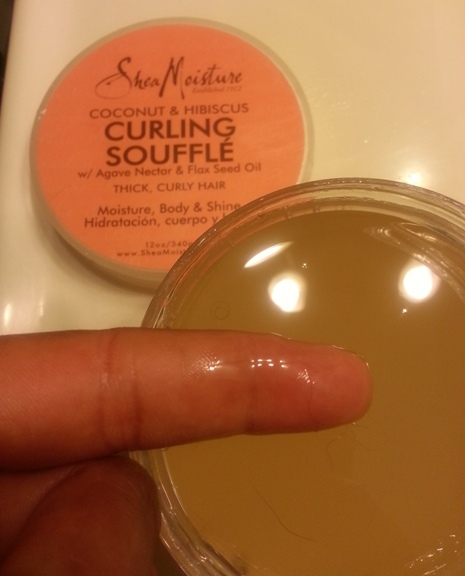 Back.” Eventually I listened to myself and got the items that would satisfy a deep desire for SheaMoisture. And would you believe I just so happened to get these items the weekend of wash day? OH WHAT JOY! All these products naturally get mixed reviews, as not everything would work on the various hair types in the natural world. Even those with similar hair types would have varying reviews on the same products, so it’s best to try for yourself to know whether or not it will work for you. Spoken like a true product junkie. So let’s get cracking; I think you’ve caught on that I’m pretty stoked. Organic Yucca & Baobab Anti-Breakage Masque w/Biotin & Bamboo Extract. Coconut & Hibiscus Curling Soufflé w/Agave Nectar & Flax Seed Oil. Raw Shea Butter Deep Treatment Masque w/ Sea Kelp & Argan Oil. Organic Yucca & Baobab Anti-Breakage Masque – it seems like it would be thick but it is actually quite light and whipped in consistency. Coconut & Hibiscus Curling Soufflé – this is really light and runny like a really watery gel. If you tip the container, it will pour out with ease like water. Raw Shea Butter Deep Treatment Masque – it is thicker than the other masque since it contains raw shea butter. Organic Yucca & Baobab Anti-Breakage Masque – it smells divine and perfumey; very sweet and clean-smelling. I couldn’t stop sniffing it once I opened it! Coconut & Hibiscus Curling Soufflé – this smells delicious and fruity although I don’t really smell coconut. I can’t really say that I know what Agave Nectar smells like, but I’m guessing like this. Raw Shea Butter Deep Treatment Masque – there is a distinct yet not overpowering smell of shea butter. I love the smell of shea butter so I really enjoy this. Organic Yucca & Baobab Anti-Breakage Masque – I applied to my wet hair (washed and conditioned), combed it through to evenly distribute and sat underneath the Huetiful Hair Steamer. 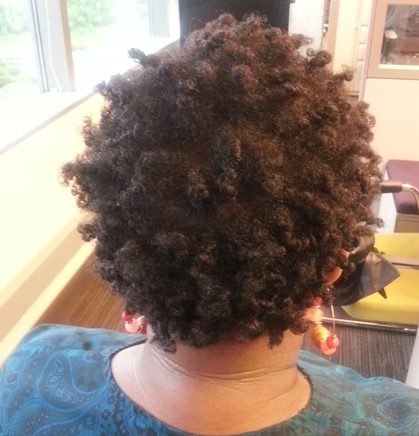 Coconut & Hibiscus Curling Soufflé – once the masque was washed out, I applied a bit of souffle to each section of wet hair before two-strand twisting, then put in perm rods. 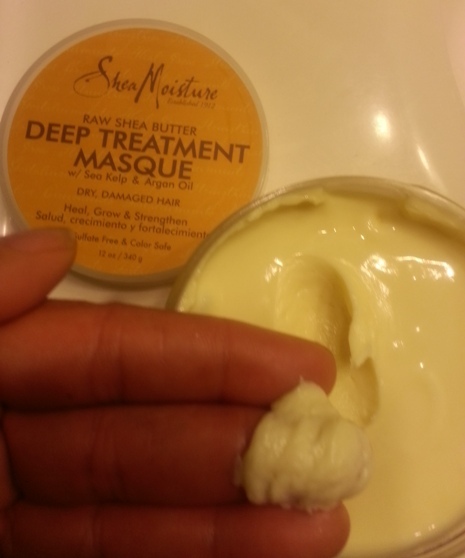 I will use the Raw Shea Butter Deep Treatment Masque another time and review as I’d like to use with the Huetiful as well. 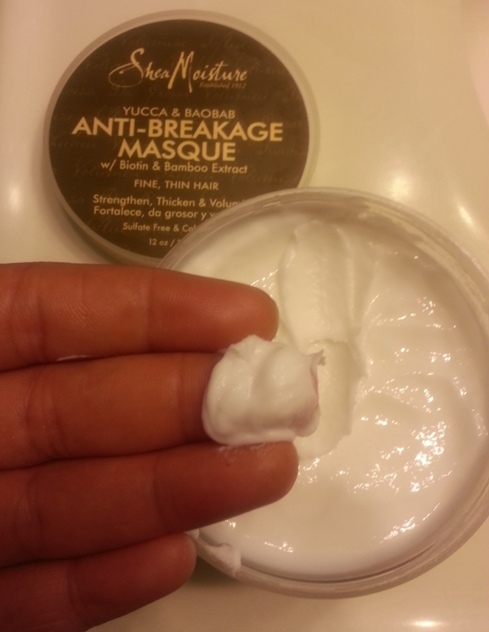 Organic Yucca & Baobab Anti-Breakage Masque – my hair was soft and manageable but I can’t really attribute all of that to the masque seeing as I’d conditioned my hair prior to its use. But this was only the first use; I do feel like with continuous use I will notice improvements in the overall health of my hair, especially since it contains biotin. Coconut & Hibiscus Curling Soufflé – My hair was not only moisturized but I’d never seen it with this kind of curl definition results! My hair was so moisturized that it felt like it was still damp and it still felt this way at the end of the day and then onto the next. My ends are a dry frizzy source of contention that I did not miss when I had locs, and it seemed like nothing I used would smoothen them. This product keeps them smooth and defined in a way I never thought possible. 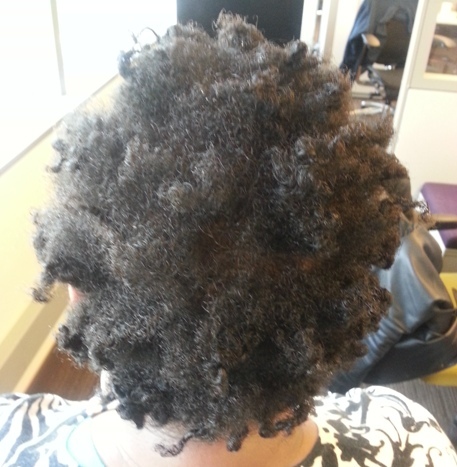 On Day 1 I liked the results but decided I’d try again that evening with smaller twists for more definition. This really helped achieve the look I wanted. Organic Yucca & Baobab Anti-Breakage Masque – I have read good things about this product and will definitely continue to use it. Coconut & Hibiscus Curling Soufflé – I. Love. This. Product. I was worried since it says for thick hair that it would be too heavy for my fine hair, but that was also why I chose to go with the lighter textured Soufflé as opposed to the creamy Smoothie. I am not disappointed with this product AT ALL. I may or may not have thought of buying the store out of this product. These items are currently available for a Sale Price of $11.99!! Um, excuse me come again whaaaat? Honey Fig prices start at $20. Now do you see why I lost my mind? I didn’t ask what the regular price was going to be since I didn’t want her to catch on and raise the price anytime soon lol. 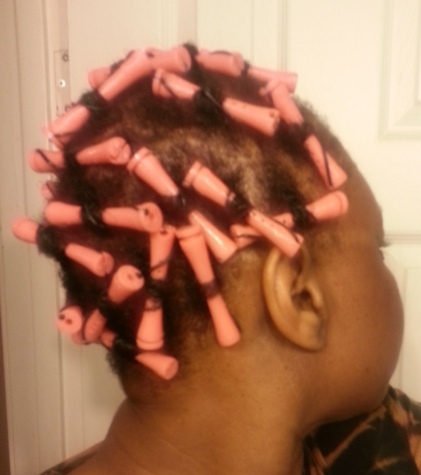 For example, I noticed KinkyCurly Curling Custard was $28.99, so…. yeah. I’ll be returning soon! SheaMoisture doesn’t end at hair care – oh no no. They also make face, bath, body, baby, hair colour, waxing and shaving products – the world is really your oyster when it comes to this product line. I want to try all of it. Sigh. Who else has tried SheaMoisture products? Did you like it? Did you not? Why? Tell me! I’d also love to hear about the other products so comment away! If you do try it, please let me know what you think. I’m always curious to get others’ feedback on things I’ve tried! Your hair looks amazing!!!!! So healthy!!! Would you recommend the hair mask for someone with very fine hair like mine???? Thanks Vann – it is definitely loving the change! I think you should try it; all natural products can never disappoint. It has biotin in it and that’s a major component for hair growth. That’s so great to hear – thanks for the feedback! I look forward to seeing how my hair responds to the masques. I love the small twists! So fun! You have to pick me up some of these products….yoy have me convinced. oh yes Dee…. They’re so good and yummy smelling! I’m always excited to try new products and especially ones with natural and/or organic ingredients. My hair has a mind of its own from day to day, and it would be nice to get some products to tame it a bit on those days when it is feeling rebellious. The Coconut and Hibiscus Souffle sounds like something I would really like – I tend to have dry ends too. Thanks for the great review! Glad you enjoyed it, Seph. They have other hair products as well in the line that just may work better for you too! I totally enjoy the souffle and there’s a smoothie which is a creamier texture!